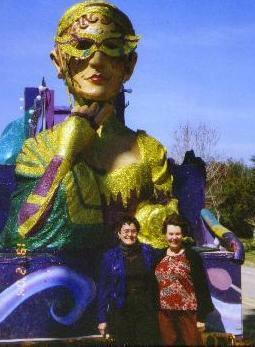 2001 – Cajun Festivals in U.S.A.
Once again, Margot Hitchcock, Cajun dance teacher and Cajun Queen of Melbourne, Australia, had the good fortune to be invited back for the 3rd time to experience Louisiana’s hospitality of great Cajun dancing, music and food, this time for Mardi Gras. Margot was over in September 2003 for Festivals Acadiens, which was written up in ZydE-Zine in the October issue. 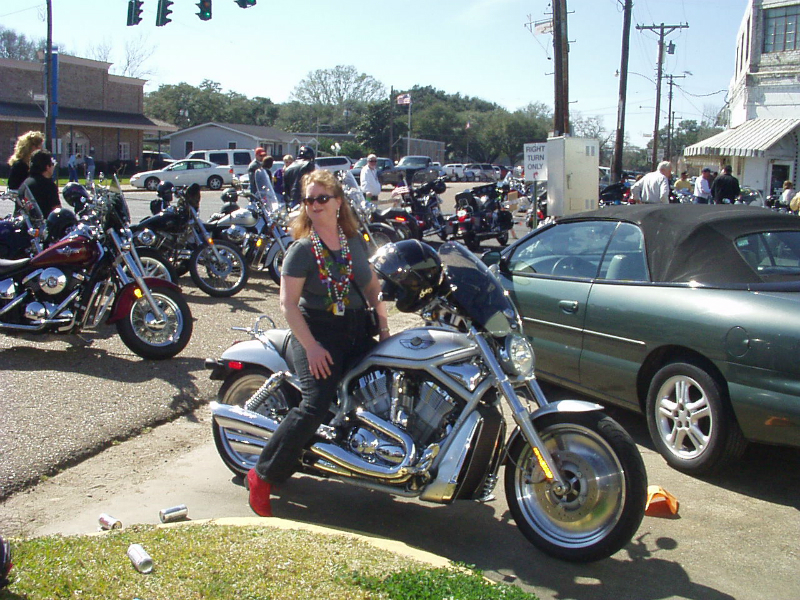 She had the opportunity to met and dance with Greg Barnes at Café Des Amis in Breaux Bridge and then later at Whisky River, where they swapped business cards. After Margot’s return to Australia, they emailed and Greg told Margot all about the exciting plans for the forthcoming Mardi Gras in February 2004. Margot was envious and Greg said if you love all things Cajun as you do, you have to experience at least one Mardi Gras in your life, and invited her to come on over. So a trip to the Travel Agent again and another ticket bought for the 23 hours trip to New Orleans and plans were underway. Greg decided I needed to spend a month in Louisiana to experience Mardi Gras to the full. So I arrived at the end of January stayed till early March. Greg met me at the New Orleans airport where I was excited to see him again after only having 3 hours sleep on the 3 planes it took to get there. He took me to dinner and then we went to the Rock ‘n’ Bowl where we got to know each other better, and had fun dancing, and then drove to his house at St Martinville. A trip the next day to a Mardi Gras shop to buy gifts for his Krewe for our first Mardi Gras ball on the next Saturday. That night we went to ‘Cowboys’ in Lafayette and Zydeco danced to Geno Delephose, and had a good time. Saturday morning we got up early to go to Café Des Amis in Breaux Bridge where we had met, and friends I had met before were surprised to see me back again. 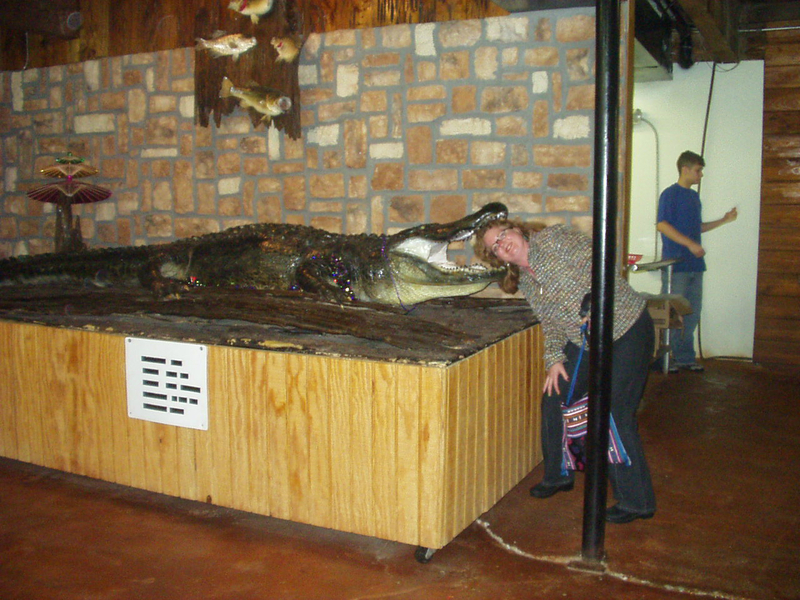 That night we went to the Atchafalaya Club in Henderson and met more friends to dance with. Greg was introducing me as his ‘mail order bride’ (email) and friends were not sure how to take him! On the Sunday I went with Greg to his work at the Acadian Cultural Centre in Lafayette, where I worked as a volunteer at the reception desk, I greeted people in an American accent saying “where’y’all from?” but then my Australian accent gave me away, which surprised some people. My Cajun rub-board friend Cynthia Baudoin who I had met at Festivals Acadiens came and picked me up and took me to a welcoming party at her place where she had invited musician friends to met me and we all played Cajun music and ate chicken gumbo and pecan pie and had a good time. Monday night I was invited by another friend, Kathy, to speak to a group of people from the ‘Circle of Friends’ about Australia and how I got interested in Cajun music and dancing. I met a lovely lot of welcoming Cajun people. Afterwards we went Cajun dancing at a bar and had a good night socialising. Greg came and picked me up afterwards. 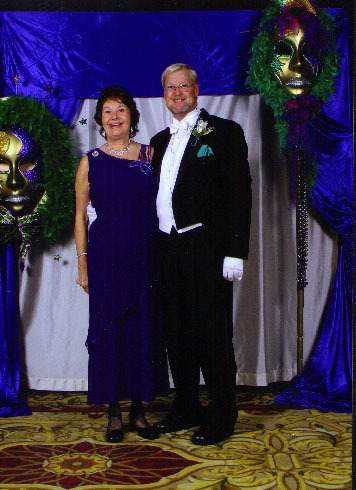 My first Mardi Gras ball was held at the Hilton Hotel in Lafayette with about 450 people, mostly members and friends of the Krewe Tous Seul, attending. Greg had joined me up as a member of this Krewe. What a spectacular night that was, the ballroom decorated in Mardi Gras colours of purple, green and gold, and in my purple ball dress I had trimmed with beads, and Greg in his tuxedo I felt like Cinderella going to the ball. The new King and Queen were introduced with their Duke’s and Duchess’s of whom Greg was a Duke. I was Greg’s first call-out dance partner, and introduced as ‘Lady Margot from Australia’. Then everyone got to dance to the big band and this was followed by breakfast at 1am in the morning. What a wonderful night we all had. Sunday night was dancing at Randol’s Restaurant in Lafayette and Wednesday at a singles night at Maximilian’s at the Hilton Hotel. Friday night was dinner at ‘Robin’s’ and dancing at the Atchafalaya Club. Saturday was the Zydeco breakfast again at Cafe Des Amis, and in the afternoon more dancing atWhiskyRiver, with four bands playing for a benefit to help support the effort to establish a Grammy category for Cajun and Zydeco music. Then after that we went back to the Atchafalaya Club to dance some more. Sunday was my first parade in which I participated in a Mardi Gras costume Greg had made for me for my birthday. He had one made the same for himself in contrasting colours of red and yellow with red chilli peppers and I really felt like an Honorary Cajun, which I was later called, with the name of Margeaux. The parade was in Scott and we got up at 8am to get to the meeting place to join to rest of the Krewe De Canaille of which Greg had joined me up as a member – the only member fromAustralia. It was freezing cold and had been snowing in Texas– the first time for 15 years. All the Krewe members had on Mardi Gras costumes in various colours, jackets and pants all with fringes hanging from sleeves and on the pants and Capachons hats and masks. We had to walk in the parade as there was some mix up with the Liability Insurance which made it too risky to go on the float without it. But we had fun pushing buggies and hauling carts behind one van, with our beads (necklaces) and ‘throws’, which we threw to the crowd. It took us 2 hours to walk, but we got warm, and had fun. Then back we went to change and go toWhiskyRiverto dance some more. Thursday I played again with Deno Boudreaux and his band with Cynthia at another Old People’s home, which was a lot of fun. 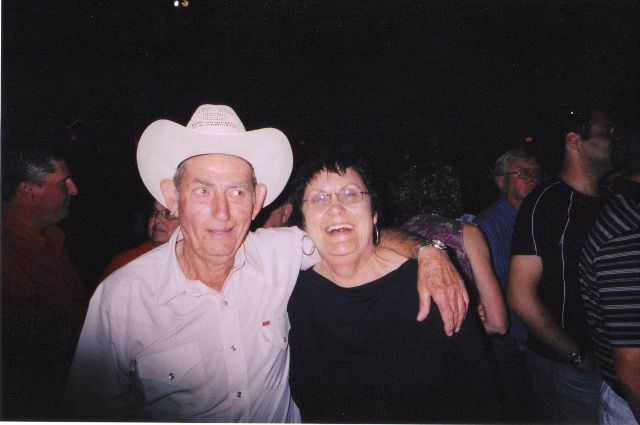 Then we went to Randols’ at night and danced some more and I played in Leo and Ray Abshire’s band again. Then we drove to the Lafayette airport to pick up Ellen from Santa Barbra in California, who was staying with us for Mardi Gras. 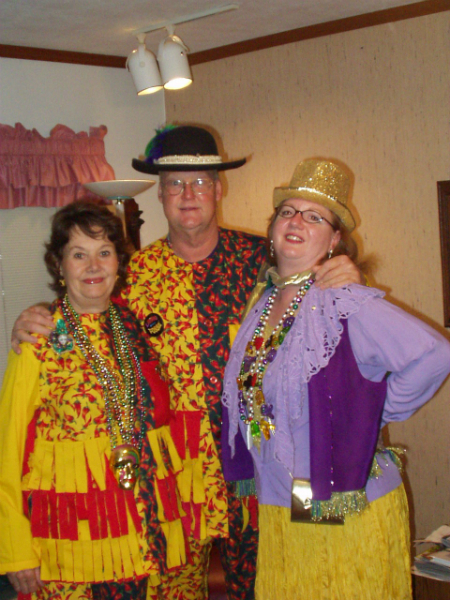 Friday, we drove again to the airport to pick up Nancy from Nashville, and that night we all drove to Baton Rouge in a friends big Lincoln car to attend the Krewe Tous Seul ball dressed in our Mardi gras costumes where the Krewe won the best Mardi Gras costumes. We ate gumbo and King cake and drove the long way back after an enjoyable night of Cajun dancing. After that, a drive back to get ready for the next function – a Mardi Gras celebration with the Krewe de Couche Couche dressed in fancy dress – we dressed as ‘trashy’, and a drive to the Grant Street Dance Hall. Another party of dancing and celebrations and fun. Sunday we went to our next Mardi Gras parade. We drove to where the float was stored on a member of the Krewe Tous Seul’s property. The two girls paid for a spot on the float, and got their recently bought ‘beads’ and ‘throws’ and hung their beads (necklaces) on the hooks provided on the top floor of the float. Greg and I then drove to Carencro, near Lafayette to find a position on the route to watch the parade. I had made a sign, which said “From Australia” and I held this up for the people on the floats to see and I was thrown hundreds of beads and even given some by hand which was very exciting. My neck got sore from holding them all on, so I had to transfer some to a Mardi Gras bag I had bought. The kids next to me had fun catching the beads I missed, so we all had a good time. Then back to Greg’s place for a rest and then we changed into our Mardi Gras costumes and went to the Krewe de Canaille ball at Randol’s Restaurant. 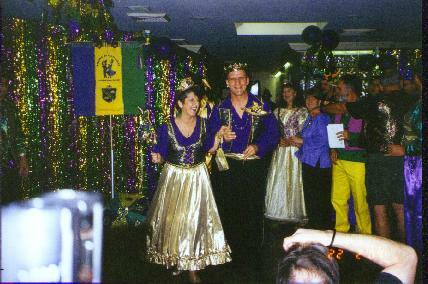 The Krewe had earlier decorated the rooms with purple, green and gold decorations and it looked splendid. The King and Queen of the Krewe were presented and the Duke and Duchess’s and the past ones, and we all walked in a procession into the dance area, where we all got to dance. On a sad note that night, one of the Krewe members who I had been dancing with earlier, collapsed on the dance floor and died on the spot. They said it was the way he would have wanted to go, but it finished the night of celebrations. Monday, Greg took us for a sight-seeing tour and lunch at a famous Crawfish restaurant where we got through 3lbs of crawfish each. 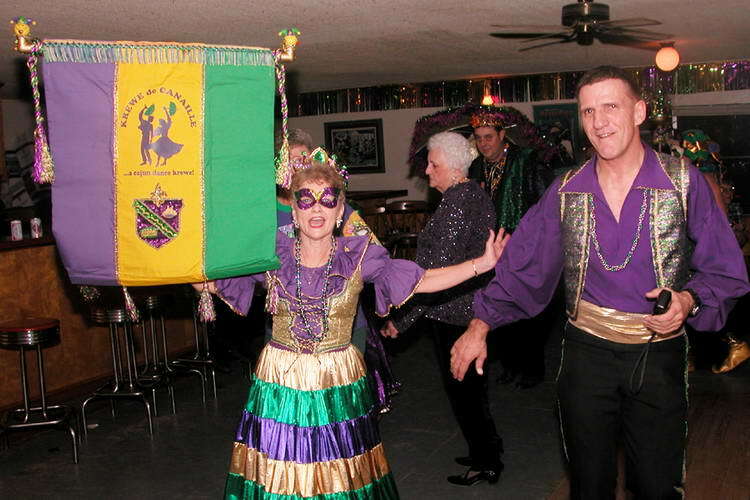 At night, Mardi Gras Eve, was another Ball; the CFMA (Cajun French Music Awards) which was held at La Poussiere in Breaux Bridge. We wore our Mardi Gras costumes and Greg and I and Ellen won $50 for the best group, which was a nice surprise. We danced to ‘Walter Mouton and the Scott Playboys’ and ate Jumbalaya for supper. Mardi Gras Day and Greg left early to take part in the Krewe Tous Seul parade in Lafayette which us 3 gals went to watch. We drove into Lafayette and got a spot where a member of the Krewe had set up his tent and B.B.Q and he fed us hamburgers, sausages and hurricane drinks; a tropical punch with rum in it. What a way to start the day! The parade was 6 miles long, and we watched two parades, the first was a coloured peoples parade and then came another parade and it was miles long. We saw our friends and Greg, and I screamed out to Greg and he threw me lots of beads and trinkets. The parade went for over 2 hours and our bead bags were full. Margot’s promotion of Cajun music and dance has entitled her to become an Honorary Cajun, with the name of Margeaux. She is now entitled to celebrate on any occasion and to always pass a good time, to love Louisiana’s food and music and share its “Joie de Vivre” (Joy of Life) with the world.